Picture by Mike Park, university photographer. 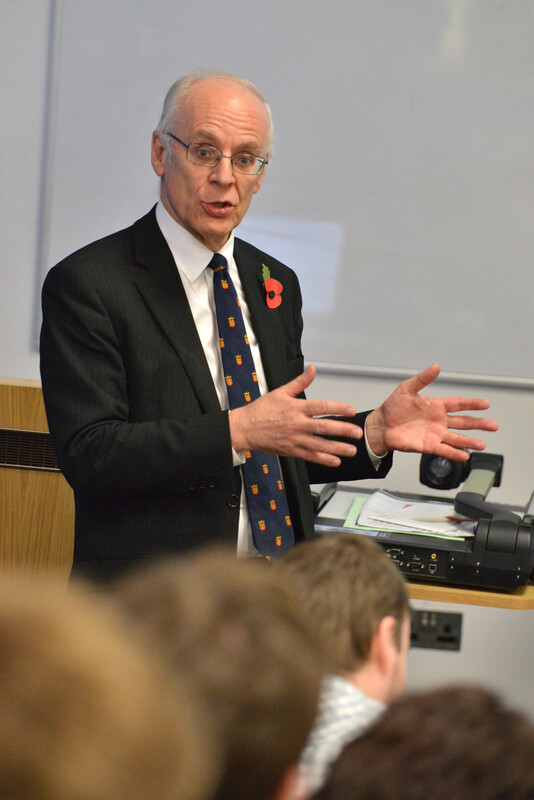 Today we had a lecture, on legislation, delivered by David Slater, a clerk in the Public Bill Office in the House of Commons. It is one in a series provided by Parliament, Hull being one of thirteen universities selected to host such events. In our case, the lectures complement our existing teaching on Parliament. During the question and answer session, I chipped in with various observations. The picture shows me making a point. Can you come up with an appropriate caption? The reader who provides one that in my opinion is especially apt and amusing will win a copy of one of my books – as well as the kudos of winning. This entry was posted in Uncategorized and tagged caption ccompetition. Bookmark the permalink. Lord Norton shows students his copy of the British constitution. Lord Norton explains the slight of hand required to get legislation passed. Possibly not that far off the mark! Lord Norton regrets thinking that using the ‘Big fish, little fish, cardboard box’ hand manoeuvre was an effective way of engaging students in a talk about the size of legislative bundles. Lord Norton at the precise moment both the hat and the rabbit vanished in full view of the captive audience. Let’s just pause for one moment, did I tell you about the fish I caught in the River Hull last week. I kid you not, it was this big. Ladies and Gentlemen, I am quite confident that after another decade of detailed discussion and work in committee, the coalition partners will be this close to agreement on the issue of House of Lords reform. Lord Norton selects Little Eva’s ‘Locomotion’ at the karaoke replete with dance moves. Sounds good, but I have no idea what you are talking about! Had a heated debate with the photographer, he wanted a thumbnail, I felt it should be a poster, so to compromise we settled for this. Irritated me no end. I could hardly claim parliamentary expenses for pet accommodation. My cat takes up about this much space! But extra accommodation for storing reading materials .. that could be an idea. Apart from Andrew’s entry, I think Matt’s is clever too so really I’m just scrapping for third place! I too liked the chosen few.